The land here is much like the weather. Change minutes to miles and in just a few, things are going to be dramatically different. 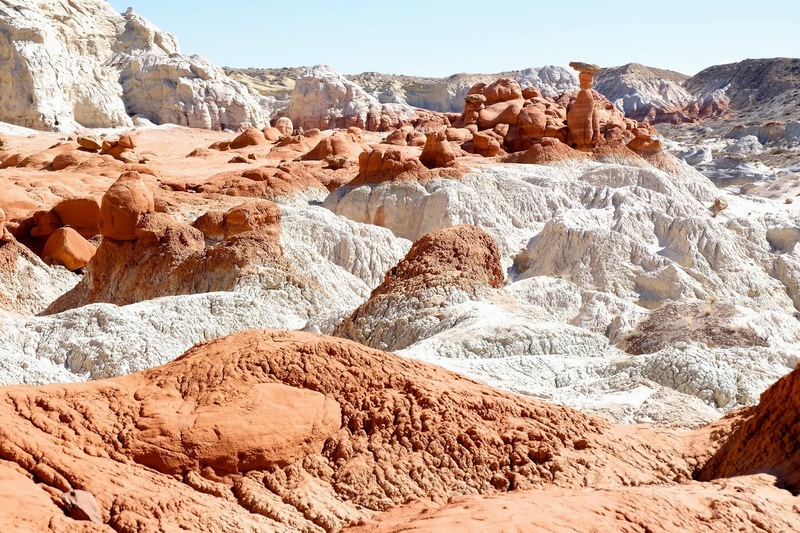 Long stretches of featureless desert are punctuated by geological exclamation points. 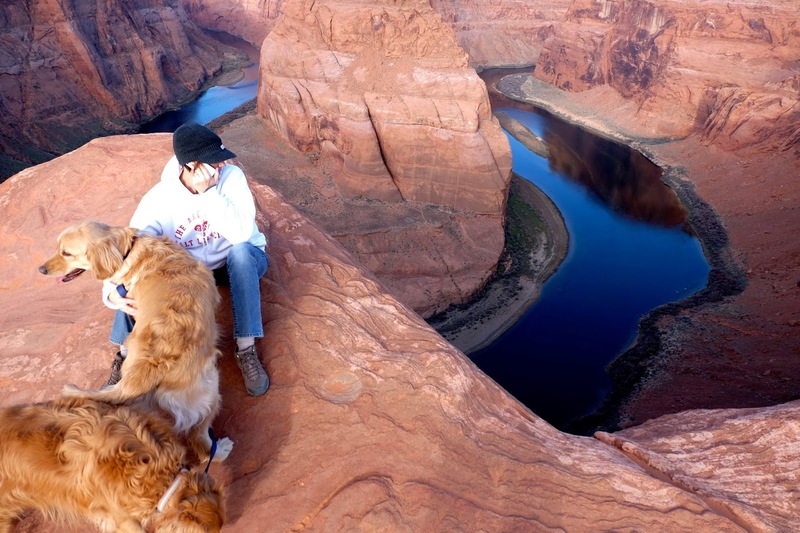 Not the least of which is Horseshoe Bend, Arizona. 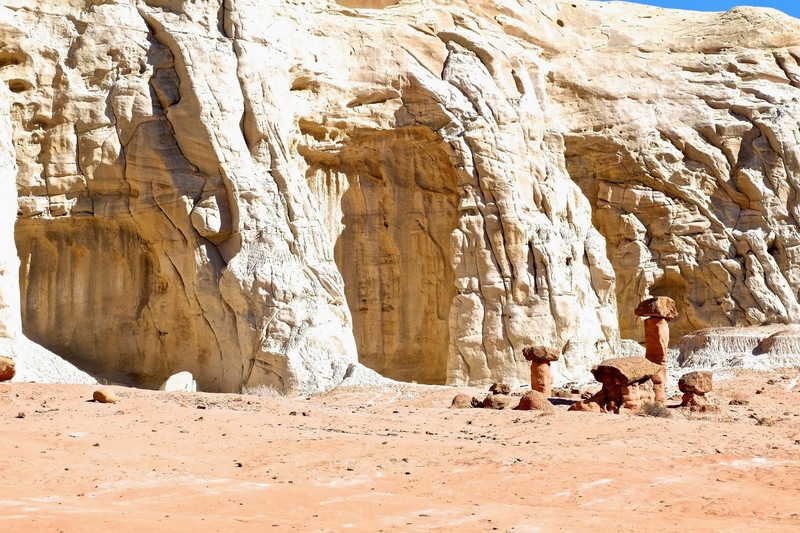 I don’t mean to understate the inherent beauty of the Colorado Plateau, but it can be terrain that one gets used to over time, like a dozen years, much like how one gets used to a favorite pair of jeans, or living by the beach, if that’s even possible. 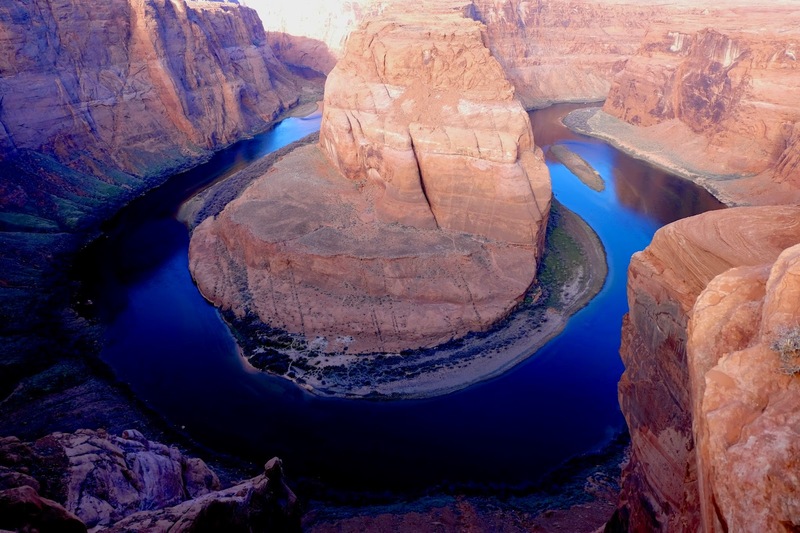 Mindy’s bucket list included Horseshoe Bend and it wasn’t until I found it on Google maps when I realized we’ve been near it often, every time we’ve put in to kayak Lake Powell, only 139 miles from our doorstep in Hurricane. 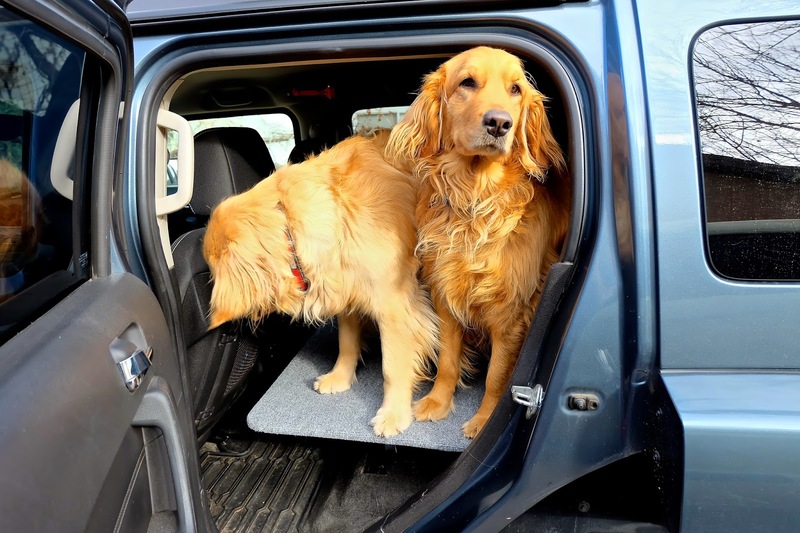 Early on Presidents’ Day morning we loaded up the dogs and made the quick trip, the inauguration, as well, of the Hummer’s most recent modification, the dog-deck. The iPhone alarm of 4:30a was set for Tuesday, Wednesday, Thursday, so it didn’t wake us up on Monday, thwarting the plan to be there before sunrise. My own internal alarm got us on the road by 5:45 and we were graced by a patch of cloud cover over Powell that reduced contrast issues of shooting into the canyon. The western sky was clear and reflected its blue into the Colorado. I couldn’t be discouraged with the lighting conditions. 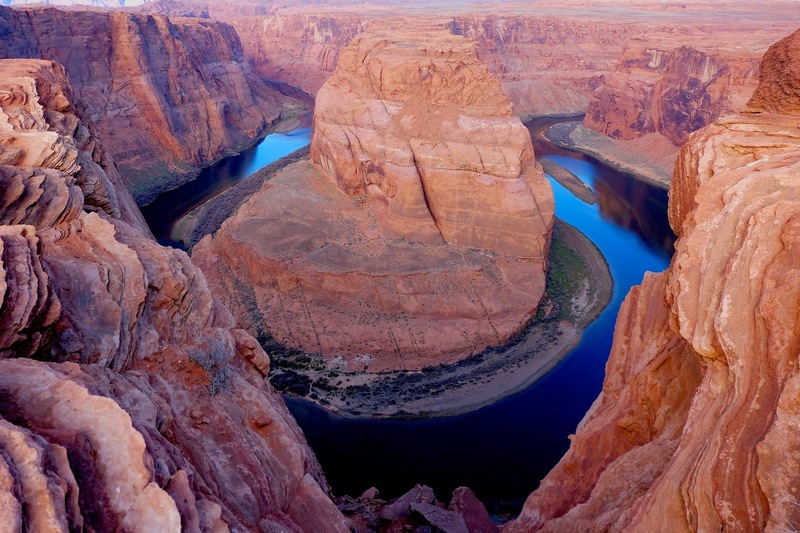 The Bend is just a few miles south of Page, Arizona, and just a short walk from the parking lot on the west side of Highway 89, which is closed, by the way, a mile or so beyond the parking lot. If you’re wanting to continue on to Lee’s Ferry you’d have to detour through Tuba City or double-back forty three miles to House Rock Road, a graded dirt passage that connects 89 to 89A dropping you at a point of access for Goblin Valley to the east or Jacob Lake (which is not a lake) to the west, making a great loop of the area. And then there’s the Vermillion Cliffs National Monument where one can find the Wave, Lone Tree, and other secrets of this area, stuff for another adventure and post. 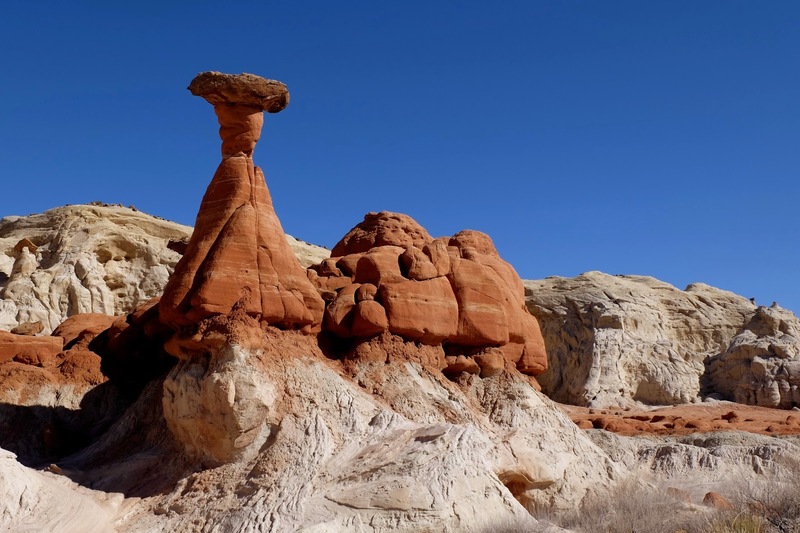 We drove the House Rock Road to find the Wave only to discover it’s a permit-only day hike, so we’re drawing for such and planning another trip that will include Lone Pine as well. 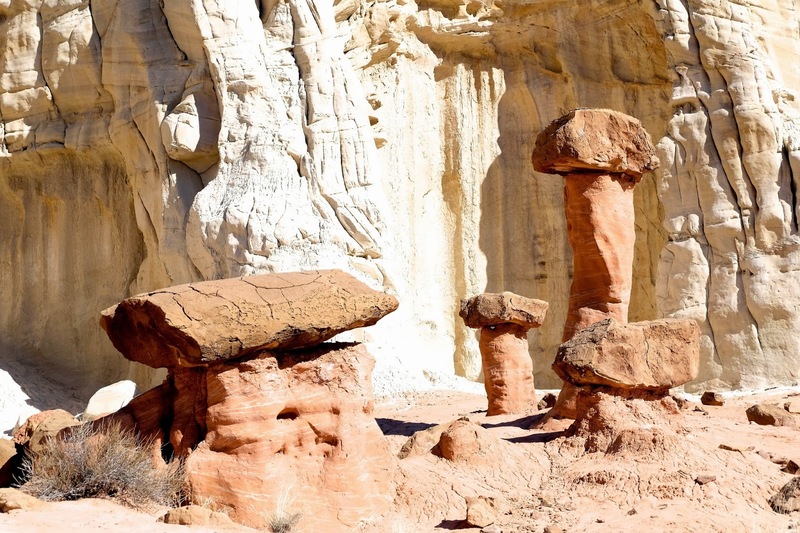 Along 89, though, between Page and Kanab is another little roadside secret, Toadstool Trail. You won’t find it on Google Maps save for an obscure and inaccurate photo reference. Instead, attention should be paid to roadside signage. There’s a parking area, a kiosk, and fence, beyond which just under a mile is this. No great feats of off-road adventure, no arduous stretches of bi-pedal traverse, but an adventure nonetheless, especially when such treasures are found in an area we’ve become far too used to. The dog-deck was a hit, by the way.